Faith is not seeing, not feeling, not understanding and not knowing, but choosing to trust and rely upon God anyway. It’s being convinced that no matter what we understand to be true and no matter how we feel, God will be faithful to His Word and perform His promises in His timing and in His way. In other words, faith is simply a series of moment by moment choices. II Corinthians 4:8 tells us we can be “troubled on every side, yet not distressed…” How is this possible? How can we walk as this Scripture says when everything within us is screaming to do just the opposite? This little book gives us the practical application to getting beyond our emotions to where we can make “faith choices” to unconditionally trust God to do His will in our lives. We can do this even if we don’t feel like it. Making a choice based on faith may not be what we “feel” like doing, but it’s the key to our victory and to walking by the Spirit. These are choices that set aside our natural thoughts and emotions and allow us to love and be loved as God desires. Whose Life Will Be Lived in Your Soul? 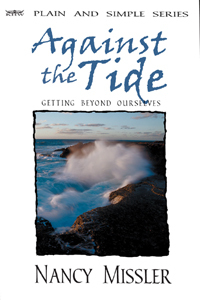 Learn more about “Against the Tide” with these supporting materials.